You’d be amazed how often we find historical artefacts during our flood work. Particularly in ancient cities like Exeter, where we’ve started work on a £30 million flood defence scheme with Exeter City Council and Devon County Council. And that’s why the Environment Agency needs archaeologists like me. With its Roman walls, medieval buildings and underground tunnels, Exeter already has a fascinating story to tell. But I think we could uncover new parts of that story. My role is to help our project team prepare for any new discoveries. Once I know what’s down there we can either plan additional time and resources to build in an area, or consider if our designs need to be changed to take any important remains into account. 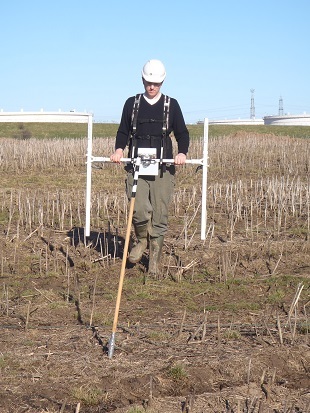 One of our achaeologists uses a gradiometer to detect buried remains. Our archaeologists in Exeter are using both modern technology and good old excavation techniques. Highly sensitive equipment, like this gradiometer, are used to detect buried remains in the surrounding fields. We call this a ‘geophysical survey’. Gradiometers measure subtle changes in the magnetic qualities of the soil. By plotting these variations in the soil on a map we can spot where buildings and other archaeological remains are located. I have also arranged for a team of archaeologists to dig some trial pits in areas where we may need to build new defences. The first of those pits was opened last week in the middle of Exe Bridges. It has exposed what may be part of an old road bridge over the River Exe, pulled down around 100 years ago. I’m excited about getting on site shortly to take a look for myself! Another part of the proposed scheme that may prove really exciting is the site of an old mill. We need to build a flood wall close to it and I can see from examining old maps that our works could reveal lost parts of the building. When the archaeological team dig some pits in this area, I think we could find the floors that the mill workers stood on 150 years ago. I’ve also been talking to Exeter’s City Archaeologist, whose approval we will need for our project. He and I are really keen to tell the local people of Exeter about anything that we find. After all it’s their city and their flood defence scheme. So information boards will go up beside the archaeological trenches planned for Exeter’s Quay area. Anything we find will go to the county museum service to help preserve the city’s heritage. And, by 2018, Devon’s capital will have a new flood defence scheme, reducing flood risk to about 3,000 properties. Find out more about the Exeter Flood Defence Scheme on GOV.UK and look out for more pictures on our Flickr album. Ed Wilson is a Senior Archaeologist. He has always worked as an archaeologist, starting off as a digger a little over 20 years ago. He worked for the National Trust and several other organisations before joining the Environment Agency in 2004.